Artist or artisan? Throughout recorded history, the arts were passed down from master to apprentice, sharing techniques that were often closely guarded. This was true for weaving, pottery, glass and metalworking – all now generally classified as “craft”; but also for drawing, painting and sculpture – now generally classified as “fine art”. Culturally the distinction is very much Western and very much modern. I recently visited the studio of Judy Stone, an East Bay artist working in enamel. Judy is a very well-known enamelist, both nationally and internationally. This is partly the result of her enamel art; and, partly a result of the extensive work that she has done in studying enameling and, to a certain extent, resurrecting the technical knowledge base of enameling. Her studio is filled with scientific books, some written by her. She teaches both the art and science at The Crucible in Oakland. 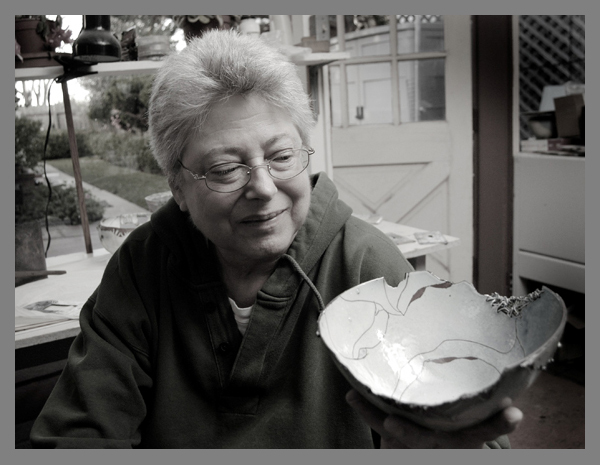 For a short time, she taught a course on enameling at the California College of Arts & Crafts (now the California College of Art). With a certain undertone of glee, she pointed out that the course was short-lived because the science was too difficult for the students and A’s were hard to come by. Still, she is a natural teacher and listening to her talk about the technical challenges inherent in creating her abstract enamel color fields, is fascinating. Enamel was a detour in life. In the late 60’s, Judy was studying German literature in Bochum, West Germany on a Fulbright scholarship. 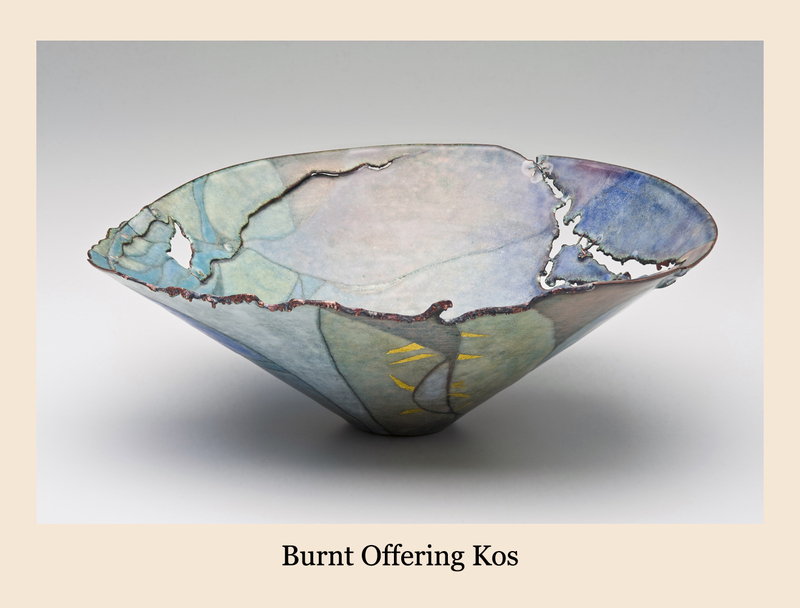 She took a study break to check out a kiln that the University had purchased for enameling. The beauty of the process was addictive. It is no accident that the annual conference of The Enamelist Society features workshops entitled “Alchemy”. The transformation of glass powder into enamel is indeed magical. The academic in her became obsessed with knowing everything that there was to know about how it worked. She soon realized how much of the traditional knowledge base had been lost. It has become something of a life mission to both preserve the knowledge of people like Fred Ball, Bill Helwig, Margaret Seeler, Jamie Bennett, William Harper and Martha Banyas who were and are working in the medium; and to resurrect (or even reinvent) techniques that have been lost. I was very interested in seeing her workshop and getting a rudimentary understanding of the science and the craft. And, we spent quite a while there discussing the technical challenges of the medium. Then our discussion moved to the works themselves and we started to talk about those in the context of fine art. In the process of becoming a master of technique, Judy also became an artist. In fact, in a traditional culture, it is only after one has truly mastered a discipline that one is allowed the freedom to unshackle from that discipline. Her work is outstanding because it is rooted in great technical mastery. It is art because it extends beyond that technical mastery; explores the boundaries of what is possible; and, incorporates elements of both intent and chance. What has drawn me to her work is its treatment of color. Much of enamel craft uses bright colors that are clearly delineated. It is almost color-by-number. The most well-known enamel technique, cloisonné, is all too often a good example. Judy’s work is more sophisticated. Her medium is the stage where she chooses to express herself. Given her interest in German culture, it is no surprise that there is a clear influence of the German Abstract Expressionists, particularly Emil Nolde. Her abstract compositions are very much rooted in landscape. And, the colors bleed into each other, in an almost watercolor-like way. 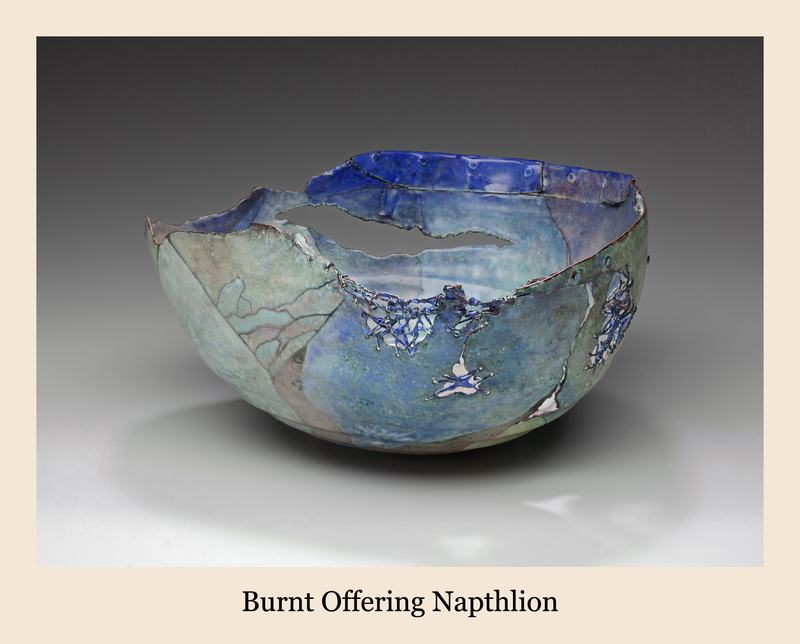 With her series, “Burnt Offerings”, she lays her compositions which look like aerial landscapes on twisted, patchwork copper vessels. They seem like beautiful fields overlaid on an apocalyptic, scorched earth. She encouraged me to pick up a piece. Visually it is a patchwork, like a Frankenstein landscape. It is a quilt of pieces with subtle color variations. Then, the form is all sharp edges and barbed wire. Close your eyes and hold the work, and it changes. 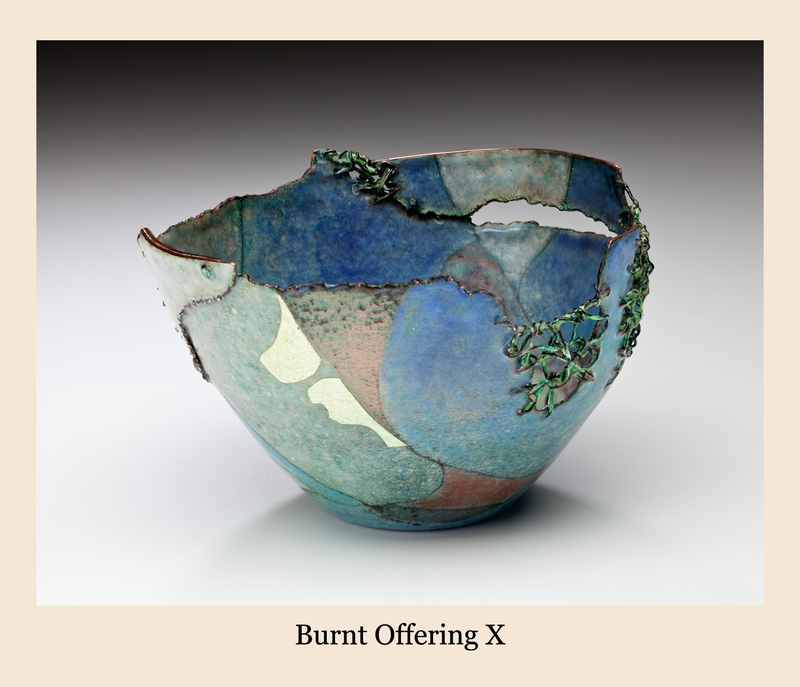 It is surprisingly soothing – like holding a raku-fired tea ceremony cup. It is work filled with contradictions. 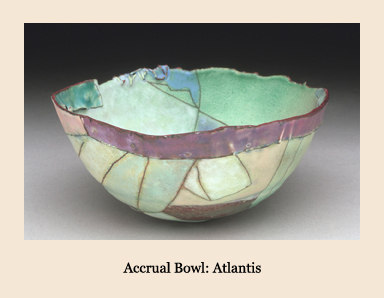 Her vessel, “Accrual Bowl: Atlantis” is more serene. It is a wistful memory of utopian times. Again the form has subtle ridges and valleys only apparent if you hold the bowl. The pastel colors are laid down in multiple firings. In between firings, each of the layers is sanded down and polished, creating subtle variations that bleed into themselves and each other. A work like this can take up to two months to complete, start to finish. 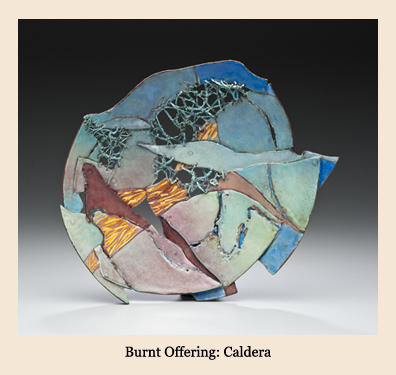 It is a technical tour de force of enameling. For those of you who may be have a further interest in the history of how Judy Stone became an enamelist, there is an article by Brian Kluepfel, “All Fired Up” that is reprinted on her website. The article originally appeared in The East Bay Monthly, Volume 35, No. 4, January 2005. 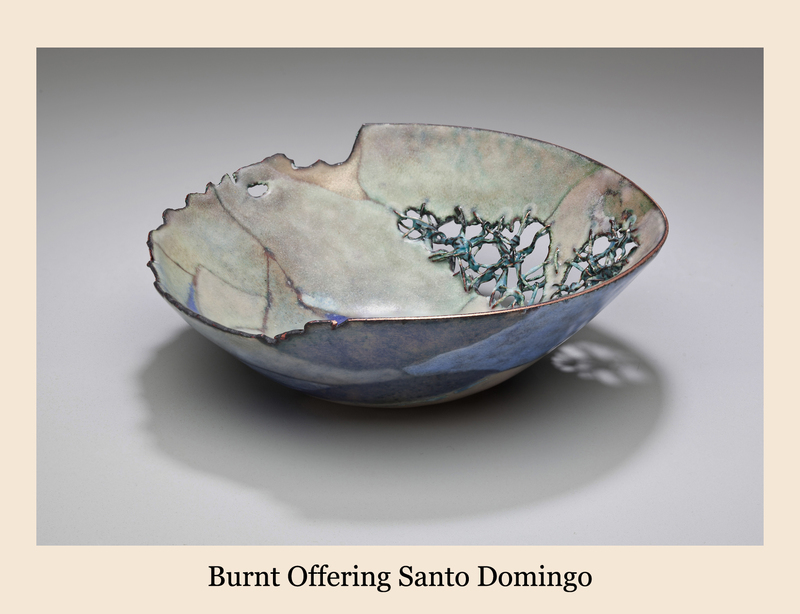 Brian does a wonderful job of tracing her journey into the world of enameling and chronicling the legacy that she has created there. Judy Stone will be exhibiting in the American Craft Council Fair at Fort Mason in San Francisco, next weekend, Aug 3rd – 5th. And, she will be at the Sausalito Art Fair for Labor Day weekend, Sept 1st – 3rd. You can see her work on her website and she can be contacted there.